We welcomed this budding little sailor to our brand new studio location for his newborn session. Little C did so well during his first ever photo shoot, and we had a wonderfully chilled morning spent talking about all the Adventures and places his Mummy and Daddy had traveled to in their times at sea. 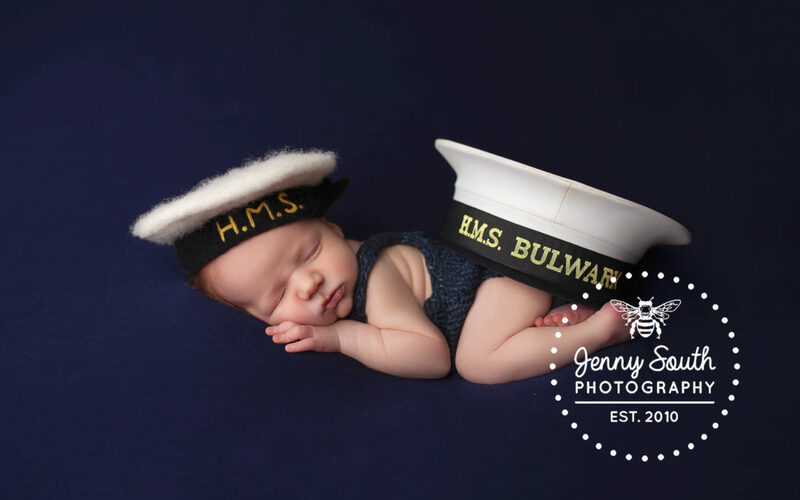 With both mummy and Daddy serving in the British Royal Navy there were tales a plenty…..
We created Baby C’s session around incorporating rich navy blues, battleship greys, and smart bright whites. A perfect fit for his parents work, and personal home decor tastes. The nautical couple had created a beautiful woodland themed nursery for their first born son. Beautiful greys and white birch adorn his bedroom walls. Baby C’s Mummy and Daddy also wanted to produce artwork which would fit into their homes interior design scheme. Mummy said it’s was modern but not too modern with simple greys and whites the same as she had chosen for Baby C’s room. Mummy and daddy wanted to incorporate both their caps into baby C’s photos. Especially Daddy’s old 1’s cap with his HMS Bulwark cap tally, which is the ship that they both met upon, those many moons ago. Luckily baby C was fast asleep throughout his session and we captured not just one but two images featuring his Mummy and Daddy’s caps. Having two military babies myself I know just how special these children are……. April is the month of the military child…. The official flower of the military child is the dandelion. Why…. The plant puts down roots almost anywhere, and it’s almost impossible to destroy. It’s an unpretentious plant yet pleasant to look at. It’s a survivor in a broad range of climates. Military children bloom everywhere the winds carry them. They are hardy and upright. Their roots are strong, cultivated deeply in the culture of the military, planted swiftly and surely. They’re ready to fly in the breezes that take them to new adventures, new lands, and new friends. Experts say that military children are well rounded, culturally aware, tolerant, and extremely resilient. Military children have learned from an early age that home is where their hearts are, that a good friend can be found in every corner of the world, and in every colour, and that education doesn’t only come from school. They live history. They learn that to survive means to adapt, that the door that closes one chapter of their life opens up to a new and exciting adventure full of new friends and new experiences. I love helping clients create sessions around personal items that tell their story. That could be their jobs or their passions, or their hobbies. Here are my 5 top tips for choosing a theme for your newborn session. What’s the story you want to tell? If like baby C’s parents you want to tell a story of how you met, how you fell in love? Maybe its’ the journey you went through to become a parent? Which ever the narrative, I’m on hand to help you craft your perfect session. What colour scheme would you like to include? Included in your session will be a few different set-ups and colour scheme options. Usually clients will pick the main living area of their homes such as the Living room, hallway, and master bedroom. Another popular choice is matching a theme to babies nursery. Think about the props you may want to use? 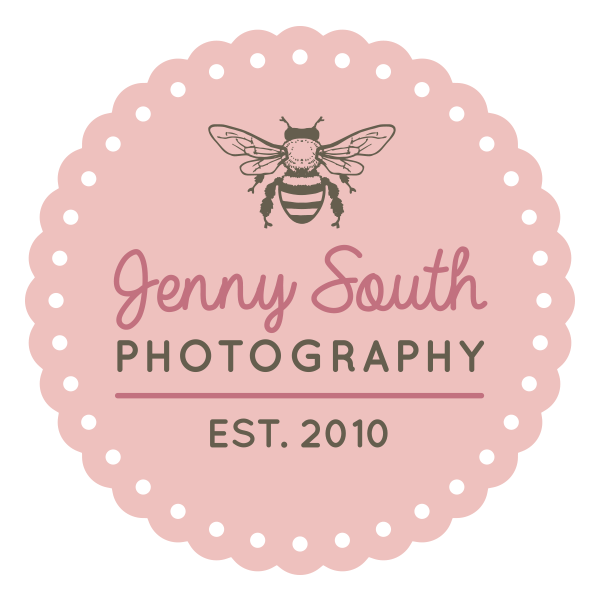 Here at Jenny South Photography we love props! From our carousel horses, giant moons, to anchors and flower crowns galore. Have a specific prop in mind, you just let me know. Your favourite characters when you were growing up? We’ve had many parents want to incorporate their favourite fairy tale into their newborn session. It’s a lovely way of passing on your love of stories and adventure to your little one, and an added bonus if it matches babies nursery. What outfits are you thinking of wearing? It’s a factor to be considered, but please don’t worry too much about your outfit. We can discuss what will work best during your pre-session phone call. The most important thing to consider when choosing your outfit, is to make sure you feel comfortable in it. I know baby C has many wonderful adventures ahead of him. With his family unit behind him, I’m sure he will go far. I hope he becomes an anchor for his parents love. Speaking to them after the session, they said they had very little mementos in their home of the Navy and how they met, so choosing images from their newborn session which included their caps would be a nice touch to have in their home. To see more from our newborn sessions click here.To know more information about what we offer in our newborn sessions than you can click here. To contact me and discuss your needs click here for our contact details. Beautiful images of an amazing family! Lovely pictures of a gorgeous little boy, he looks so content. The black and white image of the three of them is stunning! Fantastic photos , it’s a struggle to choose a favourite image as they all capture something special.